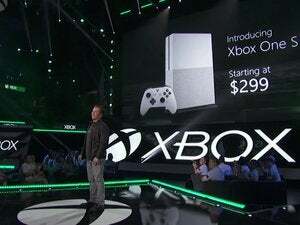 The long time Xbox flagship finally lands on PCs. We don’t really have auteur theory in the game industry, nor are there more than a handful of designers that have managed to become household names. But we do place a lot of importance on studios. Even when the people at those studios change, dozens of people cycling out between releases, there’s a feeling of continuity by seeing the same splash screen in front of a sequel as in front of its predecessor. Which makes Gears of War 4 a perilous release. It’s the inflection point. 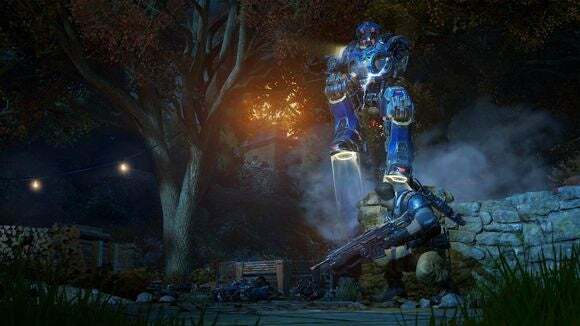 It’s the first mainline Gears of War to be developed by The Coalition, and the first without the involvement of series creator Epic. 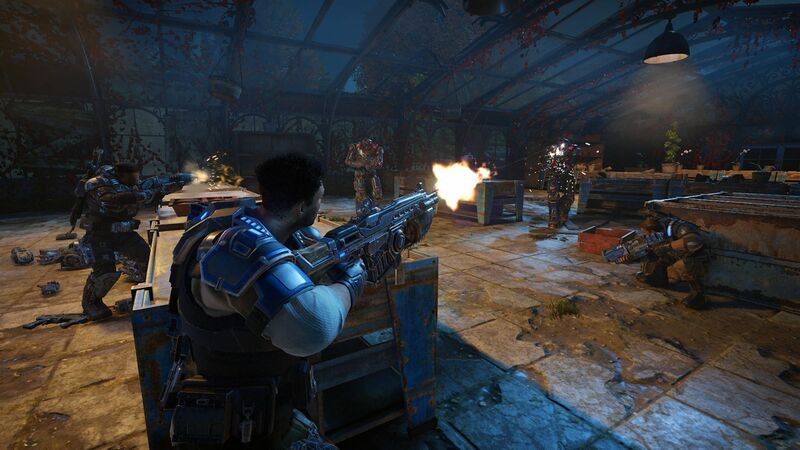 It’s also first Gears game to hit the PC at the same time as consoles—and the only Gears game to hit PCs period besides the original. And with that in mind? Well, it could’ve been so much worse. NOTE: There are light spoilers ahead, though I think all of them were covered in the game’s marketing. They’re nothing you couldn’t have guessed anyway, given it’s a Gears game. Gears of War 4 is the reset. Taking place 25 years after the apocalyptic events of Gears 3, humanity’s had a pretty peaceful time of it. With Marcus Fenix and the gang’s actions, the Lambent are gone. The Locust are gone. The Cog, the Stranded, the last dregs of humankind—they’ve been left to rebuild some sort of approximation of prewar civilization, as best they can. Too bad “And they lived happily ever after” isn’t suitable sequel fare. After a clever prologue that takes you through some of humanity’s toughest battles (E-Day, Anvil Gate) you take over JD Fenix—yes, Marcus’s son. JD and his buddy Delmont (“Del”) have gone MIA, absconded from the COG and taken up with some drifters on the fringe of society. The COG doesn’t like this too much, and its leader sends wave after wave of robots after you, the “DeeBees.” Aaaand this is how you spend the first third of the game—fighting generic robot guys. Thankfully the DeeBees soon give way to a bigger threat, the alien Swarm—smarter, more mysterious, and more in the style of Gears of War. Credit to The Coalition; it it feels plausible enough. Gears 3 really didn’t leave much open for a sequel—all the major enemy factions dead, the world in ruins. There’s no leftover hook. No strings were left dangling for someone else to pick up later. But Gears 4 does it, and without twisting the story around itself in knots. There’s a reason for the Swarm’s existence, it’s mentioned, you go “Oh okay, I guess that works,” and you move on. Far more damning is the game’s pacing. One of the things Gears of War did best—and I should know, because I just replayed the first two games and finally played the third to prepare for this review—is make every game feel like an important story. In the original Gears of War, you’re confronted by this terrible Locust threat and set out to blow it up. In the second game, you realize you underestimated the Locust, and you blow up even more of it. In the third, you blow it all up, the whole world. All three are peppered with memorable moments and memorable battles. The escalating stakes help make each feel important—both on its own and in the service of the larger trilogy-spanning arc. Gears of War 4 does not stand on its own. It follows some sort of rudimentary five-act structure, sure. But the story bogs down in the middle with filler—lots of it. Three forced “It’s Horde Mode But Singleplayer!” levels are the worst of the bunch, but even without those Gears 4 would feel padded. There’s no central antagonist figure like General Raam or Queen Myrrah (or certainly none worth caring about), the environments aren’t as grand nor as exciting as the originals, and when the credits roll you’re left feeling like you just played the opening chapters to a much cooler game. Gears 4 is an excellent setup for a new trilogy, but it’s not great in itself. 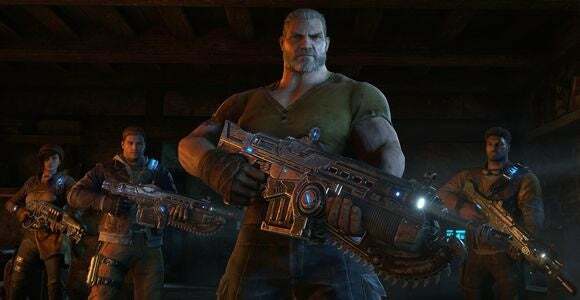 The upside is it means we’re in for a hell of a ride with the inevitable Gears 5, especially since Gears 4 still managed to nail the minute-to-minute Gears gameplay feel. The downside is we’ll have to wait however long to play it, and in the meantime it feels like we just broke the story off right when it was getting good. And JD doesn’t do the game any favors. He might be Marcus Fenix’s son, but he’s got none of Marcus Fenix’s over-the-top machoism, nor Baird’s sarcastic wit, nor Cole’s charisma. JD alternates between boring and whiny, and is quite literally the least interesting character in his own game. Less interesting than an army of generic bloodthirsty robots. 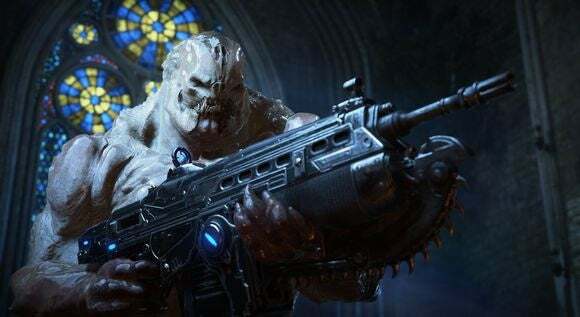 There’s room for him to grow—Baird certainly improved between the first Gears game and Judgment—but I spent most of Gears 4 wishing I was playing as either of JD’s two companions, whether the wise-cracking Del or the competent and intense Kait. Before we wrap up I want to throw in a quick note about PC performance, given the half-broken state of Gears of War: Ultimate Edition earlier this year. My colleague Brad Chacos took a comprehensive look at Gears of War 4’s PC performance, but simply put: This is the best PC port Microsoft’s put out so far. Better than Forza Horizon 3, better than ReCore, and certainly better than Quantum Break and the disastrous Gears of War: Ultimate Edition. With an Intel i7-5820K and Nvidia GeForce GTX 980 Ti I was seeing frame rates north of 120 frames per second at 1080p for most of the game, with all the settings at maximum. The lowest drop I ever saw in the game was to 90 frames per second, and that tended to happen while it was loading assets. 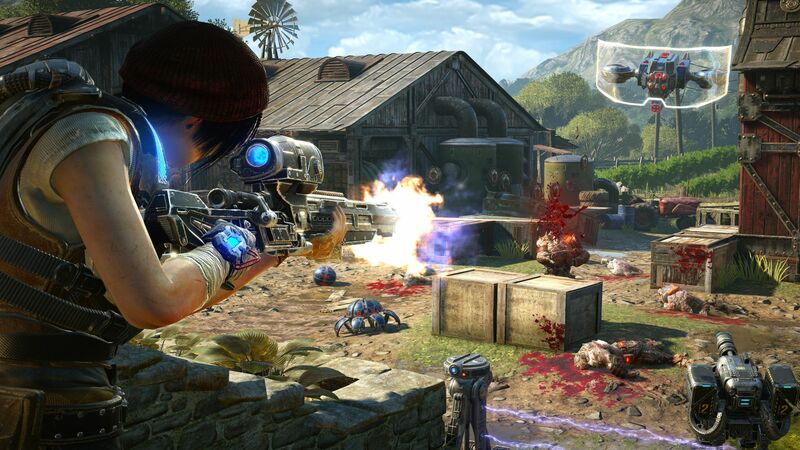 There’s a reason for those numbers: Gears of War 4 is not going to push your PC very hard. It has moments where it looks very pretty, but I wouldn’t say it’s overall an incredible-looking game. Characters are soft and cartoony, and even maxed out with an 80GB install I noticed a few blurry textures and some weird blood effects. It’s definitely a console port, though one that has had an extraordinary amount of care poured into it. But this is probably the best a Gears game has ever played. Mouse and keyboard controls make the characters way more responsive, brings recoil under control, and completely changes the feel of the game. It’s no wonder Microsoft only allows cross-platform play for Horde Mode and other co-op endeavors. Player-versus-player would be a slaughterhouse if you mixed PC and console gamers. The only thing I did miss: Rumble. I never realized how much Gears relied on controller haptics to make its guns feel punchy until I played on a mouse and keyboard. The roar of a Lancer’s chainsaw has about half the impact, and the guns don’t sound near as forceful. And of course, if you want to play on PC you need to install the Windows 10 Anniversary Update and buy Gears 4 through the Windows Store. That alone might be enough to turn some of you away. But to Microsoft’s credit, the universal Windows app platform has come a long way in the past six months, and we wouldn’t even be playing this if it wasn’t for Xbox Play Anywhere. 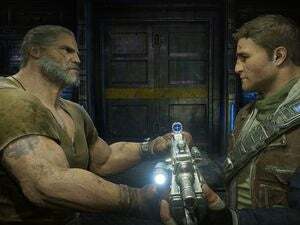 If nothing else, I think we can be pleased with the direction Gears of War is going. That’s not exactly the most ringing endorsement, true—and for good reason. I have plenty of issues with Gears 4. But they’re issues of pacing, issues of plot. Given how poorly the Halo handoff has gone in the last five years, the problems with Gears seem eminently fixable by comparison: Make JD interesting, ramp up the action, ramp up the scope. Two of those are guaranteed just by nature of this being a trilogy. And as for JD? Just give him a cool scar or something. Or kill his best friend. Literally anything to give him some personality, before he becomes humanity’s last-best hope for salvation.